Antique Brass Soft Briefcase Lock with key. This replacement Antique brass key lock suits many soft briefcases. 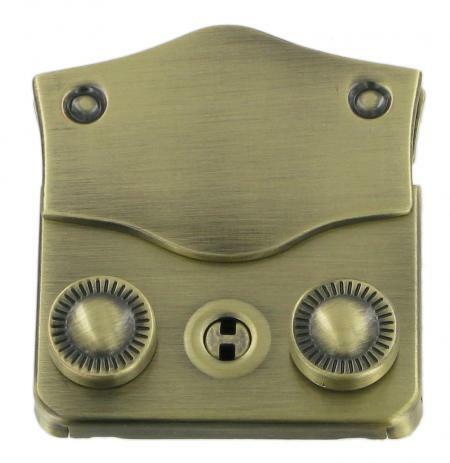 It has an antique brass finish and the male section measures 45mm x 31mm max. The female section measures 45mm x30mm. The male section will accommodate a leather flap of up to 4mm in depth. Supplied complete with key and all parts needed for fitting, including grub screws for hasp (male section) and backplate for lock. Malleable spikes attach lock (female section) to case.